VIDEO: Warriors vs. Thunder Game 3 Full Highlights - 2016 NBA Western Conference Finals - Balita Boss! The Oklahoma City Thunder rolled past the Golden State Warriors 133-105 in Game 3 of the 2016 NBA Western Conference Finals to take a 2-1 lead in the series. Propelled by a franchise postseason record of 45 points in third quarter, the Thunder was able to manhandle the defending champion. 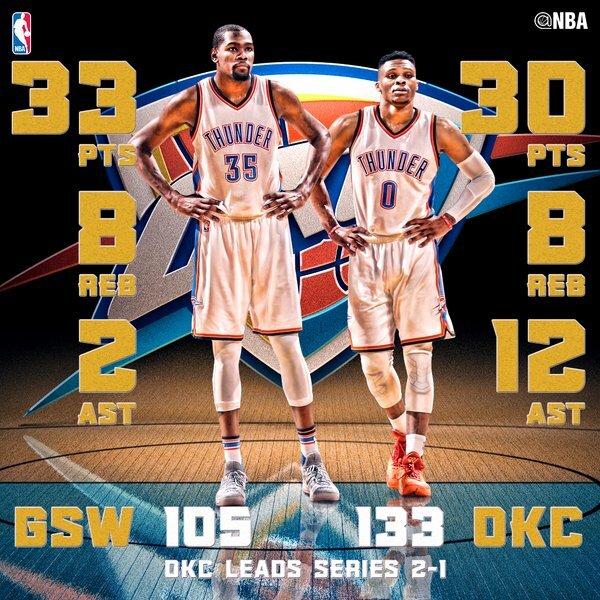 Kevin Durant, the 2014-15 MVP, scored 33 points grabbed eight rebounds, while Rusell Westbrook had 30 points, 12 assists and eight rebounds. Serge Ibaka added 14 points and eight rebounds for the Thunder. Stephen Curry, the MVP of the season, finished the night with 24 points on 7-for-17 shooting. Klay Thompson added 18 points on 8-for-19 shooting for the Warriors. Game 4 will be Tuesday in Oklahoma City (Wednesday in the Philippines).